I recently got a new job. I still work in PR, but I now work for a much smaller company that deals with only restaurants, chefs, and food and beverage brands. It’s the type of job that I would have thought was a pipe dream a few years ago, but here I am. One of the benefits of this job is that I have to know what’s on the menu of all my clients’ restaurants, and I need to try their experimental dishes to get an understanding of where their menu is going. That way, I can can help them tell their story to the media in best, most current way possible. In my first week, I went to a client’s restaurant and tried about 30 different dishes, which was obviously an amazing experience for a glutton like me. Now, I am completely ripping off one of the dishes I had. I did create my own dressing for this dish, one of the simpler and better salad dressings I’ve made recently – just apple cider vinegar, dijon and olive oil. But it went really well with the sweet apples and pears and spicy arugula, with an extra dimension of bitterness added by the fennel. There’s hardly even a recipe to share, this salad is so simple. Cut around the core of both the apple and pear so that you have chunks of fruit that you can lay flat on your cutting board. 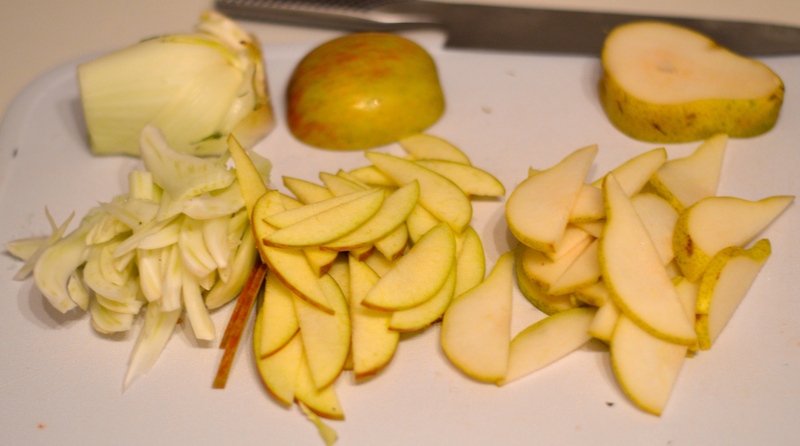 Thinly slice both the pear and apple. To trim the fennel: cut off the stalks so that you just have the bulb. Cut the bulb in half, then remove the core by cutting a wedge-shape around the tough are where the stem connected to the bulb. Slice the trimmed, cored fennel bulb thinly lengthwise. In your salad bowl, whisk together the vinegar, mustard and olive oil. 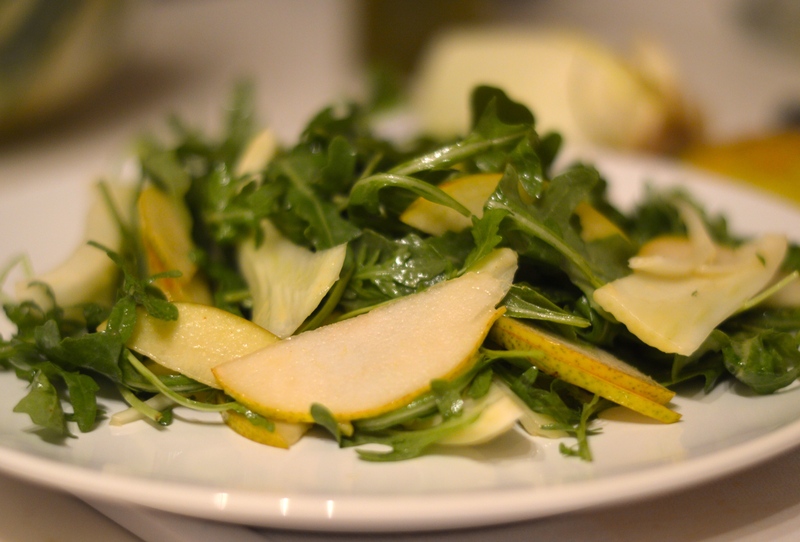 Add the arugula, apple, pear and fennel to the bowl and toss the salad until the dressing is evenly distributed.